Samsung Fascinate Android 2.2 Froyo Update To Roll Out From Tomorrow! There has already been a huge controversy surrounding the Galaxy S series of handsets Android 2.2 update in the United States. Samsung started rolling out the Android 2.2 update for the Galaxy S back in September (2010). However, it was only in the 2nd month of 2011 that the company started rolling out the Android 2.2 update for some of the Galaxy S handsets in the United States. These handsets included the Sprint’s Epic 4G, AT&T’s Captivate and the T-Mobile’s Vibrant. 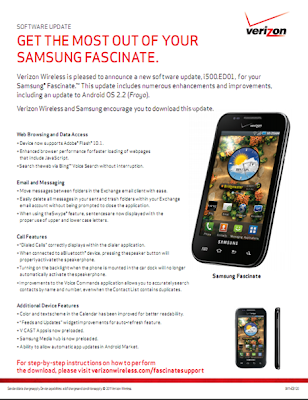 Now, Verizon has also decided to release the Android 2.2 update for its Galaxy S handset – the Fascinate. The update to Android 2.2 will bring with it some welcome features including support for Flash 10.2. The general system performance and the web browser performance have also been improved significantly. Samsung and Verizon have also taken this opportunity to load more bloat ware on the handset, in the form of V Cast Apps and the Samsung Media Hub. The update also aims at fixing tons of bugs. The whole change-log can be found here. For Fascinate owners, who are cursing Samsung for the delay in the update – Please blame Verizon! Samsung has already started rolling out the Android 2.3 Gingerbread update for the Galaxy S in Europe. Whereas, it is still unconfirmed whether the Galaxy S handsets in the United States will get the Gingerbread love or not.